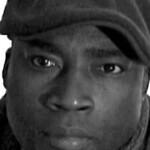 John Oluwole ADEkoje's short play Cry Baby Jones was part of GRIMM (Company One) and was nomainted for an Independent Reviewers of New England (IRNE) Award for Best New Play. He was also nominated for two IRNEs for his play Love Jones. Mr. ADEkoje is a National Award winner of the Kennedy Center ACTF — Lorraine Hansberry Playwriting award for his play Street Hawker, as well as the winner of the National Triennial New Play Competition. He was recently commissioned to write a new play by the Boston Black Theater Collective. He is a recipient of the Brother Thomas Fellowship for this documentary film, Street Soldiers, for which he won the Emerging Filmmakers Award by the Roxbury International Film Festival. Street Soldiers has been shown at the Pan African Film Festival at Cannes, France, and the World Film Festival in Montreal, Canada. He is currently editing his feature film, Knockaround Kids. Mr. Adekoje is a proud recipient of the Surdna Arts Teachers Fellowship. He is currently a Playwright in Residence at Company One and UMass Boston and a faculty member in the theatre department at Boston Arts Academy where he teaches playwriting, filmmaking, and directing.